< Sophie at 4 months of age. Lacking the breed's backwards growing ridge, purebred Sophie was given to the pound. She was a very skinny pup and constantly cold during the winter. Desiree kept sweaters on her almost all the time. Desiree's first SAR dog was a pit bull, who was far easier to train than Sophie. © photo by Desiree. Allex Michael: Thought I'd answer your email in person to avoid any misunderstanding. First of all I must reveal that the Search Dog Team (LostRaven.net) is a fictional team for the new film 'Search Dog's Raven'. The new film tells the eerie story of a wilderness search dog team. We did a lot of research for the film and Lostraven.net is factual except that the team is fictional. Fortunately, your email is not in vain, as I certainly have input on training issues with ridgebacks. Ebbey the canine actor is a ridgeback cross and portrays the lead search dog in the film Search Dog's Raven. 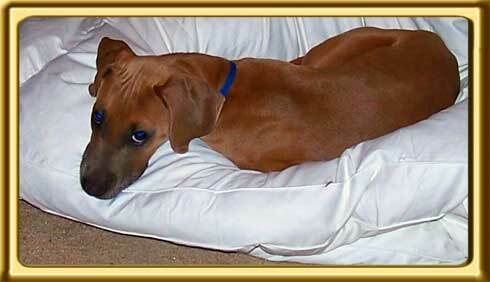 Found starving in a garbage dump as an adult, Ebbey is very characteristic of the breed (ridgeback dominant). She has turned into a wonderful dog, but there are caveats. This is my first Rhodesian ridgeback also, so I have no way of knowing if all her quirks are from her being dumped and abused, being a cross OR characteristic of the breed. Many of her behaviors seem typically ridgeback, based on documentation I read AFTER my efforts to train Ebbey were failing. Within weeks of adopting Ebbey, I was shocked, frustrated and bewildered at how difficult she was to train. Please Note: It was later discovered that she had allergies, which can dramatically alter dog behavior. Undiagnosed by several vets, due to the extreme symptoms, this took close to a year to resolve. Ebbey was also likely dumped (possibly by numerous owners based on her behavioral baggage), so keep this in mind. Once Ebbey's weight was stabilized (found starving) I discovered she really isn't food oriented (fewer options for training). She will play indoors, but has little interest in toys outdoors (too many smells). You should also know my prior canine training experiences were with a shepherd bouvier cross (shepherd dominant). We also had small strays and a poodle while growing up. Of course shepherds and poodles are stereotypically both highly trainable and intelligent breeds. Ridgebacks are also very intelligent, but from my recent research and experience only fair to average with obedience training. Trainability: there aren't many ridgeback actors, and though Ebbey has improved 1000 percent since I got her, I can understand why. Rhodesian ridgebacks aredifficult for the average dog owner to train.